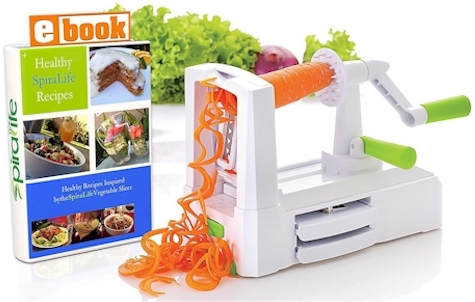 Daily Cheapskate: Spiralizer Vegetable Slicer for $10.99 on Amazon; great for KFP "zoodles"
Spiralizer Vegetable Slicer for $10.99 on Amazon; great for KFP "zoodles"
Amazon has got this Spiralizer Vegetable Slicer for $10.99 with free Prime shipping. It got 4.3 out of 5 stars over 2,507 customer reviews. Great for making zucchini "zoodles" on Passover! ALTHOUGH OTHER SPIRALIZERS CLAIM TO BE HEAVY DUTY & STURDY, they are often made of flimsy plastic with poorly constructed handles that break easily. The SpiraLife Pro is made of DURABLE, HIGH QUALITY ABS PLASTIC and cleverly designed to put its hardy strength to work as efficiently as possible. With a unique SINGLE BASE SUCTION MOUNT & EASY RELEASE LEVER, our model STABILIZES ITSELF MORE EFFECTIVELY than the awkward 4-footed suction cup base on most spiralizers. NO DANGEROUS WOBBLING! SAVE TIME & EFFORT WITH A MORE EFFICIENT DESIGN. Most spiralizers have only 21 spikes on their vegetable holder crank handles, so veggies come loose easily and fall off in the middle of your work. Our 30-SPIKE CRANK HANDLE HOLDS VEGGIES FIRMLY IN PLACE for a quicker, smoother, and easier vegetable spiral every time. Its 3 STAINLESS STEEL, INTERCHANGEABLE BLADES — Ribbon, Thin Spiral, and Thick Spiral — slice easily through veggies to produce clean, perfect spirals. OUR COLLAPSIBLE DESIGN HELPS TO FREE UP VALUABLE KITCHEN COUNTER SPACE. Other zucchini spiral noodle maker models are bulky and cumbersome, leaving you with no choice but to store them on your countertop or in the back of your cabinet. The SpiraLife Pro BREAKS DOWN INTO 3 EASY SECTIONS that fit easily into a kitchen drawer. And because this kitchen space saver is dishwasher safe, cleanup is quick and painless! OUR BONUS SPIRALIFE RECIPE EBOOK is full of EASY, DELICIOUS, HEALTHY SPIRALIZER RECIPES, making healthy cooking fun & easy! Watch our EXCLUSIVE HOW-TO VIDEO FOR HANDY TOOLS AND TIPS, so you can use your spiralizer with ease and confidence. CUSTOMER CARE PROMISE: Lifestyle Dynamics offers COMPLETE CUSTOMER SATISFACTION, period. Our customers are more important than our sales. If for any reason you are not absolutely happy with your veggie spiralizer, WE WILL REPLACE OR REFUND YOUR ORDER, no questions asked. CONTACT US directly and we will take care of you. We love to help!